Operating a mature architecture capability within a large enterprise creates a huge volume of architectural output. TOGAF provides a structural framework for an Architecture Repository to store the different architectural assets. TOGAF: Architecture Metamodel describes the organizationally tailored application of an architecture framework, including a method for architecture development and a metamodel for architecture content. 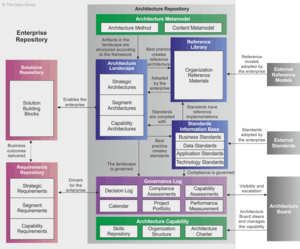 TOGAF: Architecture Capability defines the parameters, structures, and processes that support governance of the Architecture Repository. TOGAF: Standards Information Base captures the standards with which new architectures must comply, which may include industry standards, selected products and services from suppliers, or shared services already deployed within the organization. TOGAF: Reference Library provides guidelines, templates, patterns, and other forms of reference material that can be leveraged in order to accelerate the creation of new architectures for the enterprise. TOGAF: Governance Log provides a record of governance activity across the enterprise. The reference library may use the TOGAF: Architecture Continuum as a way of classifying materials. This page was last modified on 6 December 2015, at 20:28.